Fall 2002 is barely here. I took vacation early in order to get a jump on my 2002 Fall garden. If you visited my 2002 Spring garden pages, you know how the Wrath of Dog wiped out practically everything I had. So, the first thing that went up in my Fall garden was a fence! While doing a documentary for cable t.v. 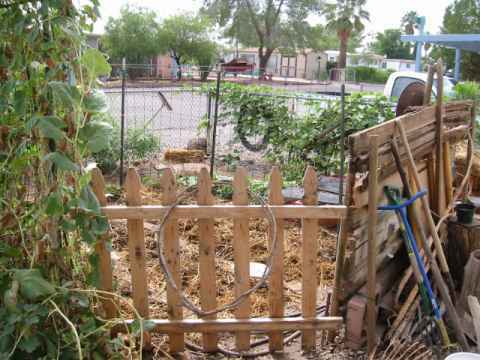 several years back, I noticed several country-style fences so simple and utilitarian, I couldn't resist. All that is involved is the posting of a series of front and rear poles along the line where you want the fence to be. Then old boards, leftover timber, etc. are slid between the erect boards. Nothing fancy, it's quick, it uses up old boards just lying around and it does the job. I love back woods look. My country fence is to the right behind the blue handled cultivator. On the front of the fence, I hung two old shovels and a gold pan. I glued some fake gold in the pan for accent . Around the fence are antique gardening equipment like an old plow, a grass cutter, etc. Seed selection this Fall is: two different beans, three kinds of carrots, a couple kinds of peas, radishes, beets, and lettuces. They are in the sprout boxes to the rear still working on their second set of leaves. A new experiment this year is Biodynamic infusions. JPI sells microbial infusion packs which are supposed to boost soil fertility, production, plant growth, etc. I ordered three main sets, two sets requiring 20 minutes each of vortex stirring (like a witch over her cauldron, eh!) I got the prepotenized formulas because ordinarily the infusions would take a whole hour each to stir. After two years of this treatment, the soil is supposed to be remarkably improved. I used my September vacation to do those projects that hardly ever seem to get done. 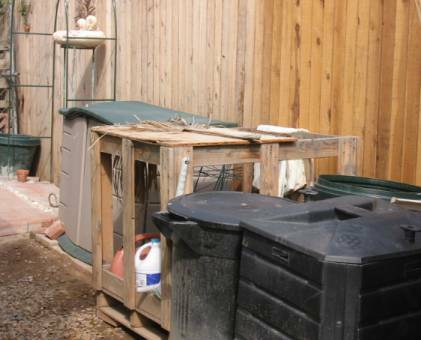 I condensed my two compost piles into one - that's the square bin at the far right of the picture. Next, I squeezed in two trash cans for those plant leavings that just don't compost well. The wooden box next to that is what I use for my planting table. It's wonderful. Just the right height and plenty of off the ground storage underneath for soil bags, watering can, etc. I snagged it from work just before they were going to trash it. The last green box is my formal garden shed. In it I have my chemicals, shade screens, and other garden items that are not dog proof. Organizing this area has made a world of difference in my gardening. It seems everything is so much easier to find and work with now! For those of you who visited my 2002 Spring Garden pages, you saw the huge Devil's Claw plant. 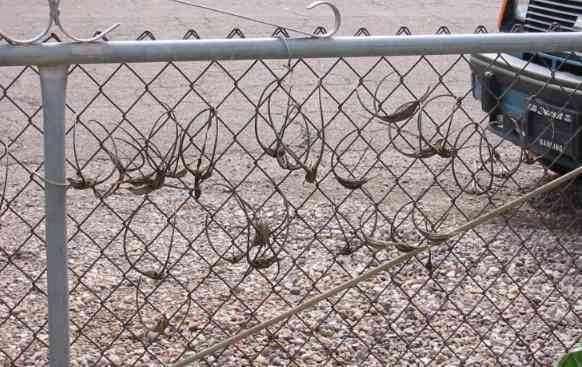 Here are some of those claws hanging on the fence to dry. They turned out wonderfully black this year! Return to Kasin's 2002 Spring Garden. Return to Kasin's main Tripod page .